Passing the California State B.A.R. joeycrosetti May 18, 2016 Projects No Comments on Passing the California State B.A.R. Residents of the state with a population nearing 40 million people may be familiar with the biennial notification that comes with their automobile registration renewal: SMOG CHECK. California’s emissions testing is notorious for being a buzzkill on making major engine modifications to cars. Some people avoid it entirely by tinkering with SMOG exempt vehicles produced before 1976, while others try to keep a low profile and play the game of “smogging” their cars for a few more Benjamin’s than advertised at the local SMOG check station. So how can you keep the hot rod spirit alive in a state that has Hitler’s regime in charge of emissions? Well it’s time to grab your Batman themed lunch box and backpack and take a trip back to school. To legally have a modified engine in a car built from 1976 and onwards, parts have to have C.A.R.B (California Air Resources Board) E.O number, showing that the parts have been deemed emissions compliant for operation on the roads and highways of our favorite left coast state. Typically big name manufacturers like Edelbrock or K&N will have C.A.R.B approved products, because it takes a lot of money and red tape to earn that sticker. Not every car will have bolt on go-fast parts readily available, so enter the world of motor swaps. Dating back to the invention of the automobile, the usual goal of most gearheads is to put the biggest motor they can in the lightest, smallest chassis. Fast forward to the 21st century, and there’s a few more hoops to jump through. Let’s go over the basic rules to getting a motor swap legalized in California. One of the first rules is that car motors can be swapped into other car chassis, and only truck motors can be swapped into other truck chassis. So a Chevy Suburban motor can’t go into grandma’s old Caprice. Next comes the rule that the motor must be of the same year or newer of the vehicle the motor is going to go into. The idea being that the emissions will be as clean, if not cleaner than the standards originally set for the car receiving the motor. If you’re putting an OBD2 motor into an OBD1 car, you will have to retrofit the code reader port as well to show full functionality. Once you’ve decided on a swap for your project car, you’ll want nearly everything off the donor vehicle. Everything from the intake through the catalytic converters must be stock from the donor vehicle or modified to follow the same layout (this applies to the exhaust usually). All emissions equipment must be present and functioning as well. Performance parts with a CARB E.O. # may be acceptable for applications such as headers or intake manifolds. For sake of getting through the referee process, stick with stock parts for now. Air intakes and mufflers (or lack thereof) are fair game…unless your concerned neighbors want to file a complaint about the gunshots that occur every time you let off the gas coming down the street. The final step in the CA legal motor swap process is setting up an appointment with a state referee who works for the Bureau of Automotive Repair (BAR). They are usually located at select California Community Colleges. The inspection process is very thorough, so they’ll go through your car with a fine tooth comb, making sure everything is present and in compliance. After the visual process over, they’ll go about testing the emissions of the car. Should you pass entirely, you’ll receive a sticker denoting the engine is legal, and the car can be taken to a regular smog tech next time you’re due for a smog check. Research motor swaps thoroughly so you can gauge whether it is feasible to get it legalized. Swaps such as e36 motors into e30 cars are very well documented, while others such as LSx swaps into 240sx cars are a little more ambiguous. DO YOUR RESEARCH, otherwise you will have wasted a nice chunk of change on a paper weight that can’t be driven on public roads. Have documentation/diagrams ready to go for the referee. 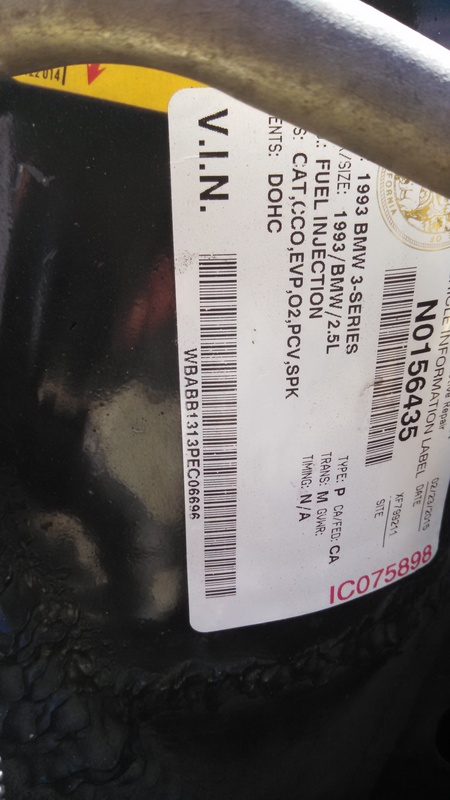 Often times they’ll want to see that the motor was legally purchased, so have items such as the VIN, and ECU numbers readily available to make the process run smoothly. Emissions and exhaust diagrams will help in cases where you needed to make small modifications for fitment purposes. The idea is to show you’re trying to stay within the guidelines of the law. Do an emissions pretest. This means take a preliminary to smog check to make sure your car can pass before wasting time setting up an appointment. Since this is a state/government supplied service, they don’t exactly have drop-in hours, and appointments can take a few weeks to a month to book. Don’t get discouraged about failing. On swaps that are less documented, failure is immanent. Take the notes and advice from the referee and use it to fine tune your swap. Each referee is different and uses their own discretion, so be polite and play by their rules. They’re the gatekeeper to your $8.25 sticker. I hope that this has been a starter’s guide towards performing a California legal motor swap. It takes time and patience, but the end result is worth it for the peace of mind, along with the grin factor of your new higher horsepower power plant. There are other ways around the system to get high horsepower, but going through BAR is the way to do it so there are no hassles or questions asked down the line. One might say that you can simply register your car outside of California, but eventually that’ll draw red flags to law enforcement. Also, at the end of the day, don’t you like living in a state with beautiful people and sunny beaches better than being surrounded by fields of corn and snowy winters somewhere in the Midwest? I know I do…but I can’t say the mob with pitchforks and torches behind me agrees.